In my Quest to find the perfect, or at least the most adaptable, format of Bullet Journal, I considered many options. As Australia is the Land of Absurd Shipping Fees and Mediocre Postal Service, I figured it might be more financially beneficial to purchase my stationery items from Australian stores. Unfortunately, Leuchtturm 1917 Notebooks are difficult to find in Australian stores and even more difficult to find at a reasonable price. Officeworks and Dymocks have Moleskine Notebooks available, but they are very expensive, so I can’t honestly recommend them. So, because I am rather hermit-like and prefer to avoid leaving my house during the summer, I decided to search for my preferred notebook on eBay. I managed to find The Nile , which is an Australian eBay store, and they sell Leuchtturm 1917 Notebooks. There’s a wide variety of colours, page-layouts, and sizes available. The deciding factor for me was the free shipping and, because it’s an Australian store, I experienced a short delivery wait (mine was delivered the next day). Content Warning: The Nile website sells a variety of stuff, but it has a predominant Parent-and-Child theme on the homepage, if that kind of thing is a problem for you, I recommend searching for Leuchtturm 1917 Notebooks via eBay. While my Leuchtturm 1917 Notebook greatly pleases me, it is only 250 pages long, and I considered the notion that perhaps it would make more environmental and economic sense to invest in a Ring-bound Planner instead. 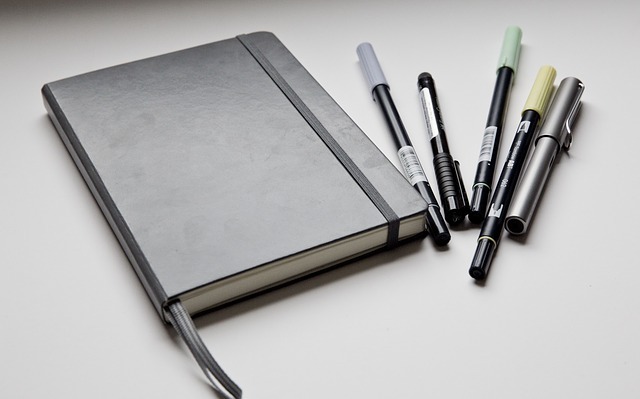 Most Ring-Bound Planners come with a standard set of Paper Refills. For example, Dokibooks and Kikki.K have Beginner Paper Refills available. This could possibly be a lot easier to manage than hand-drawing my preferred layouts/spreads and they would look much neater than my clumsy attempts at drawing. I could support a small business by buying refills from Etsy. I could even make my own paper refills, logically I know this will never happen, but I like to pretend it’s a possibility. Well, here’s the rub, it turns out that Ring-bound Planners are a lot more expensive than Notebooks, thus making them rather inaccessible to someone such as myself. It seems as though stationery companies are aware of the long-term benefits of a ring-bound planner and are trying to price-gauge potential customers as much as possible. The thing is, while I like a couple of specific designs from each company, I don’t like the vast majority of the colours and designs these ring-binder folders come in. Most of the designs are in pastel colours, so if that’s your thing, you’ve got a lot to choose from. Unfortunately, I’m not a fan of pastel colours, so I don’t see why I should pay such a large amount of money on an organising tool that I don’t find aesthetically pleasing, The more money I’m spending, the greater value I place on aesthetics. Aesthetics aside, the sheer cost factor alone makes these types of planners inaccessible. I mean, think about it, Kaiser Craft is a craft store that is usually too expensive/over-priced for my tastes, yet I can get a ring-binder planner (folder + cardstock) from Kasier Craft for AU $39. If Kaiser Craft stationery is the “cheaper alternative”, that’s a serious problem. 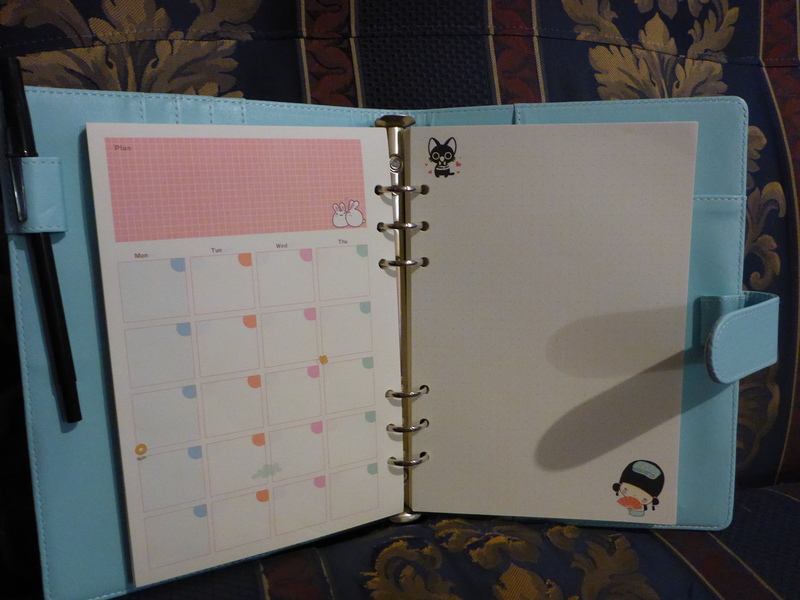 Due to the high-cost level of these types of planners, I thought about assembling my own ring-binder planner, while the results are aesthetically okay, I’m not sure about the cost-effectiveness of such an endeavour. Image Description: a picture of a A5-sized six-ring-binder folder, the folder is faux-leather and a robin’s egg blue colour. There’s a short strap attached to the folder, at the end of the short strap, there’s a magnet in order to keep the folder closed. 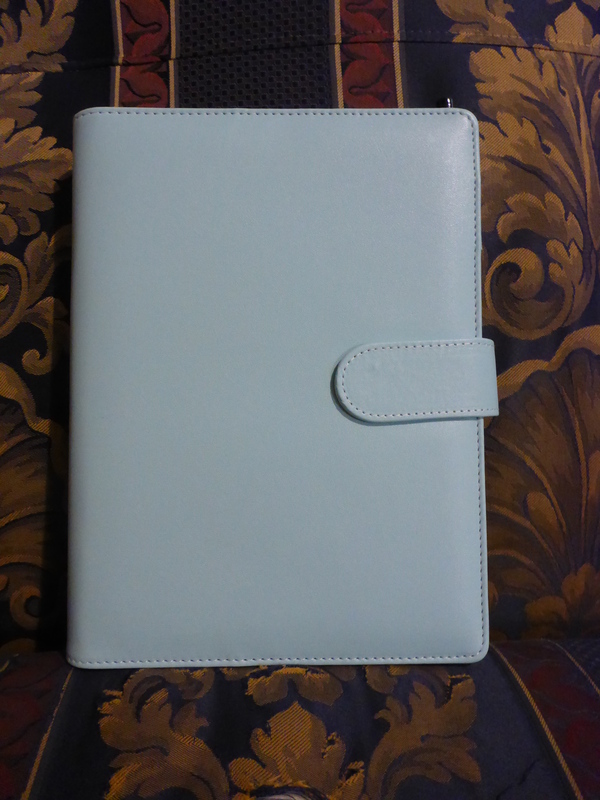 Image Description: a picture of the inside of an A5-sized six-ring-binder folder, the folder is faux-leather and a robin’s egg blue colour. From left to right, there’s a black pen in the pen loop on the left side, and on the left side of ring-binder is a Monthly paper-roster, up the top is a large rectangle for notes, beneath that are columns and rows of squares marking out the different days of the week. On the right side is a selection of Dotted paper, on the top left corner of the page is a little black cat, on the bottom right corner of the page is a person with a pink fan wearing a blue kimono. 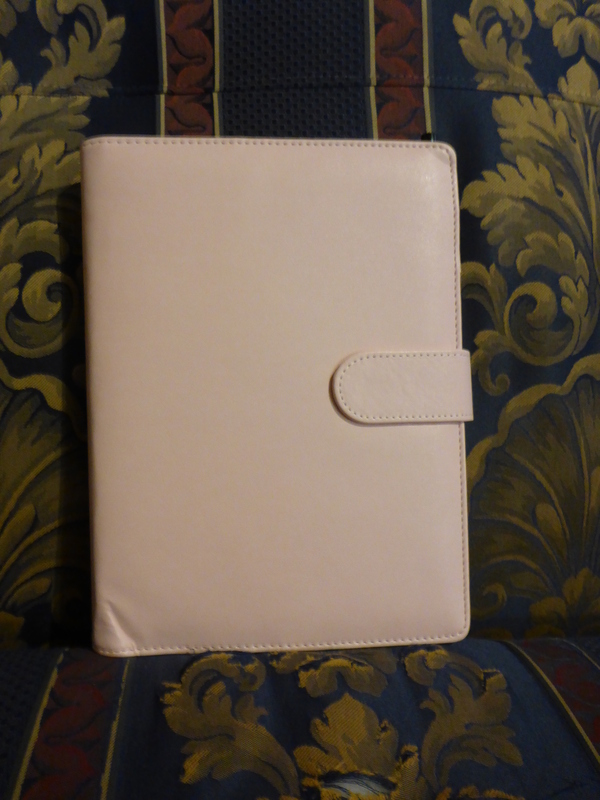 Image Description: a picture of an A5-sized six-ring-binder folder, the folder is faux-leather and a pale-pink colour. There’s a short strap attached to the folder, at the end of the short strap, there’s a magnet in order to keep the folder closed. 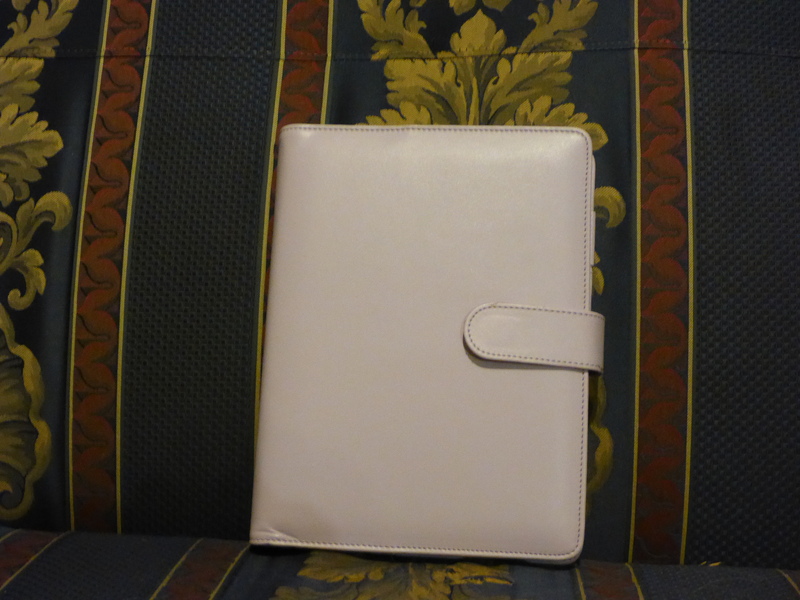 Image Description: a picture of the inside of an A5-sized six-ring-binder folder, the folder is faux-leather and a pale pink colour. From left to right, there’s a black pen in the pen loop on the left side, and on the left side of ring-binder is a Monthly paper-roster, up the top is a large rectangle for notes, beneath that are columns and rows of squares marking out the different days of the week. On the right side is a selection of Dotted paper, on the top left corner of the page is a little black cat, on the bottom right corner of the page is a person with a pink fan wearing a blue kimono. Image Description: a picture of an A5-sized six-ring-binder folder, the folder is faux-leather and a lavender-purple colour. There’s a short strap attached to the folder, at the end of the short strap, there’s a press-stud clasp in order to keep the folder closed. 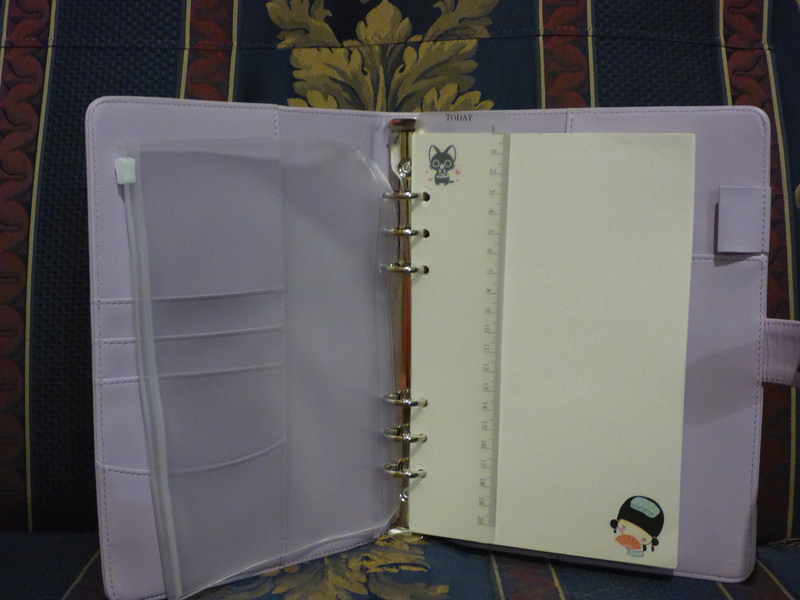 Image Description: a picture of the inside of an A5-sized six-ring-binder folder, the folder is faux-leather and a lavender-purple colour. From left to right, a plastic Zip-Lock envelope. 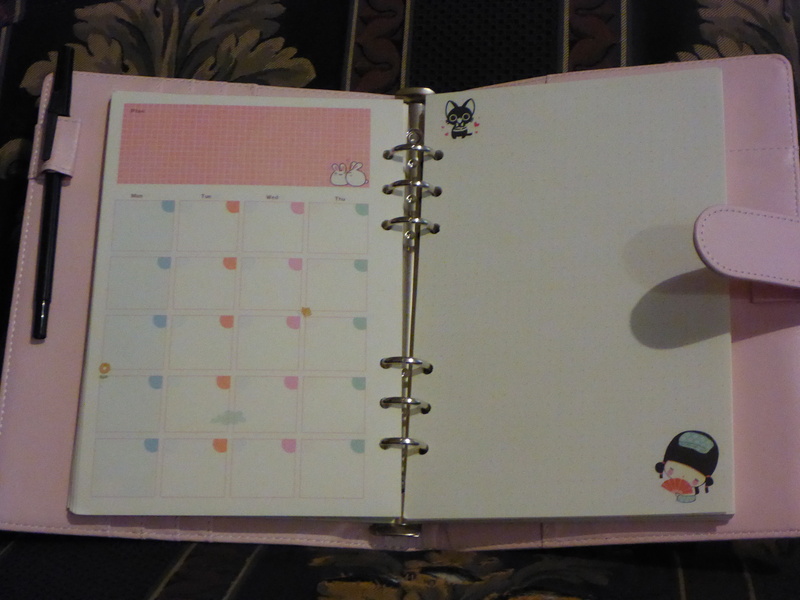 On the right side is an elastic pen-holder loop, a frosted plastic ruler with “TODAY” written up the top of the ruler, and there’s also a selection of Dotted paper, on the top left corner of the page is a little black cat, on the bottom right corner of the page, there is a person with a pink fan wearing a blue kimono. Seller Warning: I bought the blue and purple folders from the same eBay seller, lepean88, and while the blue folder was perfectly fine, the purple folder was not. The other two folders have a magnetic clasp to keep the folder closed, while purple folder has a metal press-stud, this was a mild annoyance but not a big deal. What was a big deal was the fact that there was already card-stock in the folder and the card-stock smelled like mushrooms (I presumed this was mould?). The mushroom smell saturated the folder so that it also smelled like mushrooms/mould, which rendered the folder unusable. 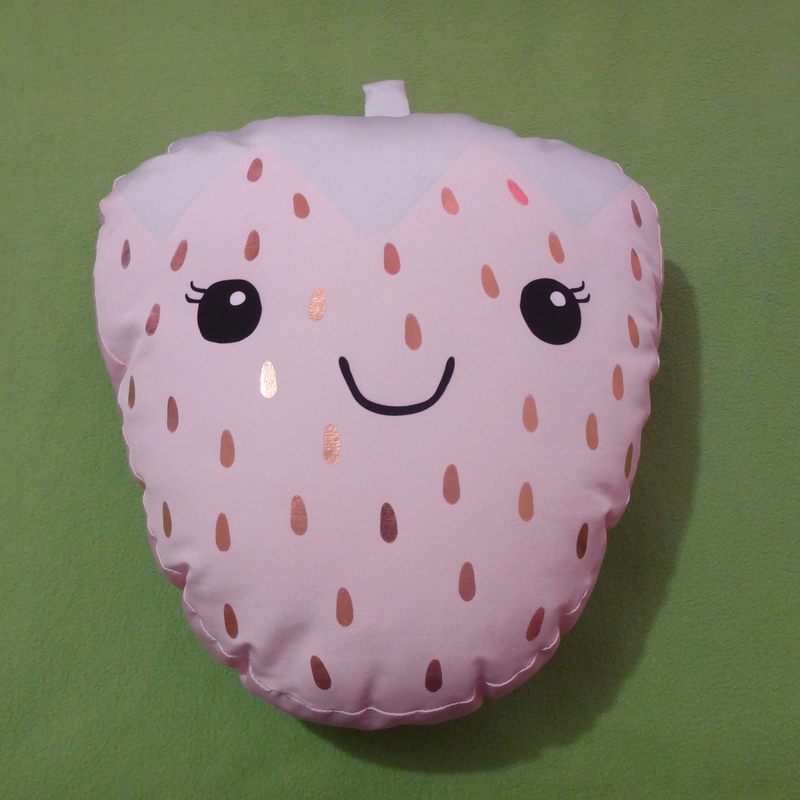 When I contacted the seller to report that the product was mouldy and therefore unusable, they insisted that as the item had been delivered, I couldn’t get a full refund. I then suggested a partial refund, and they have not responded. I have only just managed to air-out and clean the purple folder to an acceptable level.